Because of improved communication and real-time information, the law enforcement community can plan where to place resources ahead of time, instead of only reacting to events after they have occurred. This report comes at an opportune time as the law enforcement community is undergoing a major transformation. Traditionally, communication within law enforcement was often linear and hierarchical. Today, communication happens in real time across jurisdictional boundaries. Because of improved communication and real-time information, the law enforcement community can plan where to place resources ahead of time, instead of only reacting to events after they have occurred. Based on a survey of leaders in the law enforcement community about cloud computing, Wormeli gained an increased understanding of their major issues, which include concerns about reliability and availability, performance requirements, cost of migration, and the recovery of data. In response to these concerns, Wormeli explains how the law enforcement community can effectively respond. 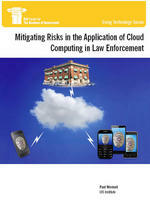 The report concludes with six recommendations on how law enforcement organizations can successfully implement a move to cloud computing. Listen to the Federal News Radio interview.